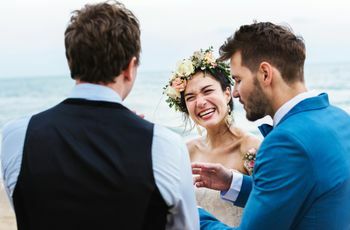 Planning your wedding while being a bridesmaid or groomsman in a friend or family member's wedding can seem stressful, but it's actually totally doable. Here's how. If you’ve recently gotten engaged and are planning your wedding, and so are some of your besties, get ready to enter what might as well be called Wedding Season on Steroids. You’ll have to call on all of your strengths to do the double-duty of having to plan your own wedding while being in other peoples’, but fear not: It’s been done! You’ll do a lot of planning, a lot of stressing, and a lot of compromising, but you can have the wedding you’ve always dreamt of and still be an ace wedding party member, you can! You want to plan the World’s Best Wedding and give it your all, but you also want to be an amazing friend and give your wedding planning pal your all. Well, you can’t give everything your all, because you’re going to pass out. (Unless you’re a wedding planner, and even then…) So, if your pal asks you to be maid of honor a week after you get engaged, and her to-do list for you is longer than the aisle runner you just bought for your own wedding, take a step back and ask yourself: Can I do both and be my best? No, you can’t, and if you commit to both, you’ll only end up becoming frustrated, resentful and overwhelmed. Have a serious talk with your friend and admit that while you intend on being there for them as much as you can be, and still want to be in their wedding in some capacity, you can’t take on a huge responsibility while planning your wedding, because they deserve someone’s full attention and you deserve to give your wedding yours. You can still have just as pivotal a role in your friend’s wedding as a bridesmaid as you might have as a maid of honor! That trope about how people planning weddings only ever want to talk about their weddings. Guess what? It’s totally true. And if your close friend(s) are also planning weddings, there’s about to be a massive amount of wedding talk in your future. 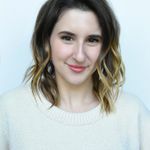 It’s going to drive you crazy and exacerbate the stress levels all around—it might even cause some friction in your friend group (see: people who are not getting married will be sick of talking about all of these weddings, see: jealousy and comparison, see: she talks about her wedding more than I talk about mine, etc.) A smart strategy would be to schedule wedding chats with your other soon-to-be marrying friend(s), so that there’s a time and place to air grievances, share drama, swap inspo, ask for advice and air more grievances. When the wedding chat ends, it’s all over till the next time (unless there’s an emergency, duh). This will help keep the wedding talk under control and keep your life (and your friends’ lives) balanced. 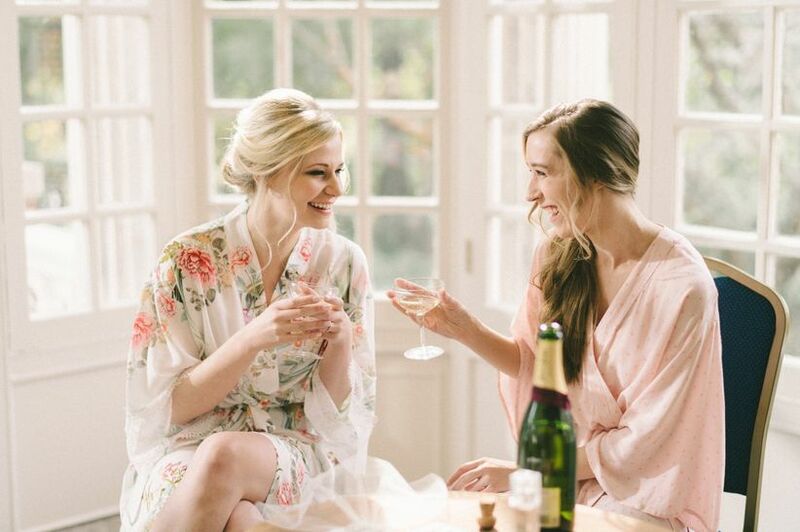 If you and a close friend are on similar wedding timelines, there’s a risk you could overlap important events like your bachelorette party without even realizing it, putting your mutual friends into quite a pickle. It’s worth having a planning session where you guys map out all of your important wedding events together (with your spouses-to-be, obv!) to make sure there’s no chance that anyone is butting into anyone else’s spotlight, and to give mutual guests plenty of time to attend both and be fully present at both. Strategic planning will also help keep you focused on your own wedding events when you need to, and give you the breathing room to devote yourself fully to your friend’s wedding that you’re in when you need to. Because you should never feel like you’re juggling the balls from both at once. 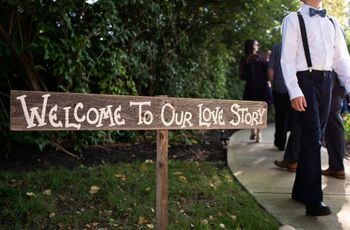 For the average bridal party member, their friend’s wedding is not something that’s going to take precedent over more important things in their lives like work or their relationships. 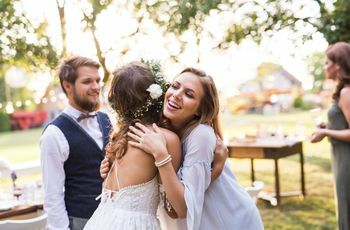 The same should be for you, even though while planning your wedding, you may feel a stronger compulsion to be there extra for your friend out of solidarity. As a fellow planner-of-a-wedding, don’t get swept into what you “feel like” you should be doing for your other friends planning weddings. Your wedding, and furthermore, your job and life, come first, always, and no one should realistically expect anything else. If you were not planning a wedding, and your wedding-planning pal asked you to use several vacation days for a cross-country dress shopping road trip, you’d probably decline. Don’t feel like anything more is expected of you just because you’re going through the same planning motions. If you have to decline events for a friend’s wedding in order to keep your own planning-life balance in check, remind them that you have as much going on in your life as they do and can’t do it all, but you still love them! Don’t project your stress on their wedding. This one’s easier said than done, but crucial for your sanity and the sanctity of your friendship. If you’re stressing majorly about a detail of your own wedding, or someone’s behavior in relation to your wedding, you can’t carry that negativity into your role in your friend’s wedding, even though you might have the urge to do so totally involuntarily. 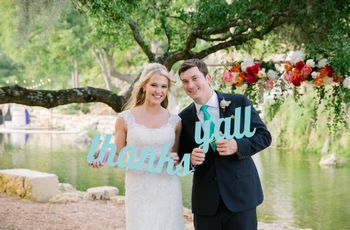 Your wedding-planning pal knows you’re going through a ton planning your own wedding, and should give you your space, but at the same time, they deserve their own experience not to be influenced by the hard times in yours. Similarly, if you’re feeling like your planning is going smoothly but you’re feeling bogged down by the bad vibes of your less-than-bridechilla-pal, set some boundaries and take care of yourself—wedding planning panic is contagious and nobody should give it, or catch it, carelessly.